You think you know a little something about catalog marketing and analytics? Take this quiz, and find out for yourself. You may just find out that you're the best qualified candidate for a job at a major retail brand! Question #1: You mailed a catalog to 1,000,000 households, and generated $4,000,000 in sales. Your CFO wants to "grow the brand". She asks you what would have happened if you had mailed 1,333,333 households. If you mailed 1,333,333 households, what is the total amount of net sales you would have generated? Question #2: Your catalog was 96 pages, and generated $4,000,000 in sales. Your CFO wants to "grow the brand". Next year, she wants your catalog to total 128 pages. If you hold circulation constant, what is your forecast for total sales generated by a 128 page catalog? Question #3: Online, your average order value is about $100. When a customer orders from a 124 page catalog over the phone, the customer generates a $110 average order value. If you offered a new, 180 page catalog, what is the average order value you would forecast? Measure total sales generated at your call center. Match back all online orders generated by customers mailed the catalog over a three week period of time to the catalog you mailed, sum those orders to call center orders attributed to the keycode on the back of the catalog. Execute a mail/holdout test, subtracting the difference between the mailed group and the holdout group. Question #5: You mail 1,000,000 catalogs, generating $4,000,000 in sales. 40% of sales flow-through to profit, prior to subtracting catalog marketing costs. The catalog costs $1,000,000 to send to customers. How much profit did you generate by mailing the catalog? Question #6: Assume you mail a monthly catalog, three catalogs total per quarter. In the quarter, a customer generates $12.00 demand from catalog marketing, and $12.00 independent of catalog marketing. You decide to add one catalog to the catalog stream. How much total demand (catalog + online) will a customer generate in the quarter with one four catalogs mailed instead of three catalog mailed? Question #7: Your CFO demands that a newly acquired customer pay you back within twelve months. A newly acquired customer generates $15.00 profit in the first twelve months. 40% of the demand generated by a newly acquired customer flows-through to profit, prior to catalog marketing costs. An individual catalog costs $1.00 to mail. Assuming that the response rate is 2%, and assuming that the average order value is $100, can you generate enough profit in the first twelve months to offset the profit lost in the initial order? Question #8: In Question #7, how much profit did you lose, per respondent, on the initial order? Question #9: Your annual repurchase rate is just 28%, meaning that a measly 28% of last year's customers will purchase again this year. Still, you generate EBITDA of 15%, meaning that 15% of all sales convert to profit, after subtracting all expenses. Is your business a failure? Question #10: When you do not offer 20% off of your order, you generate a response rate of 5%, an average order value of $100, a cost to mail the catalog of $1.00, and 40% of demand flows through to profit. When you do offer 20% off of your order, you generate a response rate of 6% and an average order value of $110. Which strategy is more profitable? Question #11: You possess 2,000,000 twelve month buyers. 40% of your twelve month buyer file will repurchase last year. How many new+reactivated customers do you need to satisfy your CFO's request to grow the twelve month buyer file by 10% next year? Question #12: Using the statistics in Question #11, how many new+reactivated customers do you need to satisfy your CFO's request to grow the twelve month buyer file by 10% next year, assuming you are able to increase your annual repurchase rate from 40% to 45%? Question #13: A customer generates a $130 average order value, purchasing 3 items per order. What is the average price per item purchased? Question #1 = 1. You use the square root rule to approximate sales. Question #2 = 1. You can also use the square root rule to approximate sales here! Question #3 = 1. AOV is unlikely to increase significantly with more pages, given the online AOV. Question #4 = 3. Mail/Holdout tests consistently deliver better results than those generated by matchback algorithms. Question #5 = $600,000: $4,000,000 * 0.40 - $1,000,000. Question #6 = 2. There will be cannibalization, meaning that you can't assume that the fourth catalog will generate what the first three catalogs generate. That rules out answer three. Answer one makes no sense whatsoever, leaving only answer two as a reasonable answer. Question #7 = 1, Yes. (0.02*100*0.4 - $1.00)/(0.02) = Lose $10 up-front, generate $15 profit in the next year, net = +$5.00. Question #8 = 3 ... You lose $10.00 up-front (see Question #7 above). Question #9 = 2 ... No, your business is not a failure. The repurchase rate is irrelevant. Customer loyalty is irrelevant, it's your management of customer loyalty that matters most. If your catalog business is generating 15% EBITDA, you are a highly successful business leader. Question #10 = 1 ... the non-promotional strategy is far more profitable ... non-promotional = (0.05*100*0.4 - 1.00 = 1.00 profit) ... promotional strategy = (0.06*110*0.4 - 1.00 - 0.06*110*0.20 = 0.32 profit). Question #11 = 3 ... you need 1,400,000 new+reactivated buyers. Work backwards. You need 2,200,000 to satisfy your CFO. You have 2,000,000 twelve-month buyers who repurchase at a 40% rate, meaning that 800,000 will purchase again. 2,200,000 - 800,000 = 1,400,000. Question #12 = 1 ... you need 1,300,000 new+reactivated buyers. Work backwards. You need 2,200,000 to satisfy your CFO. You have 2,000,000 twelve-month buyers who repurchase at a 45% rate, meaning that 900,000 will repurchase again. 2,200,000 - 900,000 = 1,300,000. Question #13 = 3 ... 130 / 3 = 43.33. You probably already know this (or are executing these programs), but it is worth running a query to validate anyway. Segment customers by months since last purchase, through June 30. Add a segmentation layer ... 1 = customer visited website in June 2012 but did not purchase ... 0 = customer did not visit website in June 2012. Based on this level of segmentation, measure the amount of demand the average customer in the segment spent during July 2012. Customers who visit the website but do not purchase, especially among those with 7+ months of recency, outperform those who do not visit the website in the past 30 days by a factor of 3x to 10x. Kick out a hotline catalog to any lapsed, unmailed buyer who visits your website in the past month and does not purchase. Develop trigger-based email programs for customers who are lapsed and then visit the website, sans purchase. Call customers who exhibit this behavior, offering your handy/dandy promotional programs that you love to talk about. Dear Catalog CEOs: Step Up! Catalog, catalog, CATALOG, catalog, c-a-t-a-l-o-g.
Heck, I looked through a forty page report today, containing something like 40,000 metrics and maybe 400 lines of explanation for why business is suffering. Here are a series of words that never appeared. Answer this question for me. If you shut down your website for one month, how much business would simply evaporate? 55%? 65%? 92%? If the answer is more than 55%, then don't you think it is time that the Online Marketing Team step up to the plate and accept accountability? Or more important, isn't it about time that you step up to the plate and demand accountability of your Online Marketing Team? Why do we demand that the catalog marketer produce a square inch analysis of every item in the catalog, with metrics from demand per thousand pages circulated to profit, but we don't have a single report that links paid search to the merchandise productivity of specific items/skus? Why do we demand that the catalog marketer prove, beyond a shadow of a doubt, that the "right" customers were mailed and generated high levels of productivity, but we allow the email marketing team to get away with "the campaign generated a 22% click-through rate"? It's been 17 years since most of us launched e-commerce websites. Why aren't we demanding accountability from the folks who are now responsible for more than half of the business? If you don't like business fiction about a catalog brand trying to negotiate a path to the future, move along, there's nothing for you to see here. If you need a diversion from your dreary job, or a diversion from 100 degree heat, give this a read. Glenn Glieber (CEO): Ok folks, let's take our seats. Pepper, why don't we start with a sales update. Pepper Morgan Pressley (Chief Marketing Officer): Sales are down, again. Roger Morgan (Chief Operating Officer): Insightful. Pepper Morgan Pressley: How many ways can I say that sales are down? Sales are down eleven percent. We're eleven percent behind last year! I'd hate to have been the CEO who presided over a business plan that yielded an eleven percent decrease? Glenn Glieber: Well, we have to do something about it. I've been away for a couple of years, so what are the big ideas out there? Roger Morgan: You know, Woodside Research focuses on a three legged milk stool ... Omnichannel, Engagement, and Big Data. Meredith Thompson (Chief Merchandising Officer): Does Woodside Research have anything to say about catalogs? Lois Gladstone (Chief Financial Officer): What is engagement? Meredith Thompson: Is engagement like when you told us that every member of the Executive team had to host a blog, telling stories that would cause customers to embrace us so much that they would spend an extra $100 a year? Roger Morgan: No, that's so 2006. Lois Gladstone: Is this like when you told us that every member of the Executive team had to have a Twitter account, because Dell was selling a bunch of clearance computers on Twitter? And then you told me that it would be a good idea for me to tweet about circular references in spreadsheets? Roger Morgan: No, that's so 2009.
Pepper Morgan Pressley: Is this like when you told us that every member of the Executive team had to post pictures of meetings on Instagram, so that we could provide our customers with an insiders perspective of Gliebers Dresses, and then our customers lambasted us, suggesting that all we did was waste time snapping photos? Roger Morgan: No, that's so 2011. Engagement is so much more important than all of those tactics. Engagement and Omnichannel are like peanut butter and jelly. For example, I was watching The Matrix last night. AMC put an ad on the bottom of the screen, asking viewers to participate in an interactive online game about The Matrix. That's engagement. You fold the user into a deep, immersive digital experience that enriches the brand. Pepper Morgan Pressley: I was watching the kids last night. Lois Gladstone: Does engagement enrich the profit and loss statement? Roger Morgan: Woodside Research surveyed 339 Marketing Executives. A statistically significant 182 Executives perceived engagement to be a credible digital strategy that enriches the brand. Pepper Morgan Pressley: What did AMC do with the people who played the digitally immersive game? Did those viewers buy anything? Roger Morgan: Woodside Research says it isn't about sales, it's about creating a deep, immersive experience that enriches the brand. Meredith Thompson: My customer is 59 years old. She doesn't want a deeper, immersive digital experience that enriches the brand. She wants a free canvas bag to carry zucchini in. Glenn Glieber: What the heck are you talking about, Feldman? Meredith Thompson: Roger, does Woodside Research honestly believe that my 59 year old customer wants a deep, immersive, branded digital experience? Roger Morgan: It doesn't matter. Woodside Research says that is where the world is headed. They surveyed 339 Marketing Executives. Marketing EXECUTIVES! These leaders, our peers, say that the best customers are engaged customers, and engaged customers prefer a deep, immersive, digitally branded experience. Then customers head out to social media and share their experiences with online influencers, and these influencers increase the viral coefficient. At that point, you're looking at an awful lot of free marketing. Glenn Glieber: I love free marekting! Pepper Morgan Pressley: But like usual, Roger, you're reciting vague theoretical concepts that are virtually irrelevant to a 59 year old female dress buyer. Roger Morgan: Look, I'm not the Marketing Executive, you are. It's your job to provide solutions. It's my job to advise. Pepper Morgan Pressley: It's your job to run a distribution center. How is that robotics initiative working out for you? Humans used to pick, pack, and ship merchandise. Now you've essentially removed humans from the distribution center. Remember when we included handwritten notes in outgoing packages? Last week, I think I got a branded, digital thank you note from C-3PO. Roger Morgan: Here's the theory. You create content. Customers crave content, you know. I mean, how many times have you just lost yourself for three or four hours reading scintillating content created by your favorite brands? Dr. Gene Feldman: By 1976, I didn't see much of Heather anymore. She went to work for Jimmy Carter, and got engaged to the guy who ran field operations for Carter's campaign in the State of Kentucky. It's my understanding that she is very happy, and was an early investor in Zynga, the folks who created Farmville. Lois Gladstone: So engagement can lead to riches! Roger Morgan: The content causes the customer to visit, over and over and over again. And then, after being fully immersed in a branded digital experience, the customer buys a dress. Get it? It's called engagement! Pepper Morgan Pressley: Has anybody been able to prove the link between reading content and buying dresses? Meredith Thompson: We're all dancing around the issue, folks. What does engagement look like for a 59 year old woman? Is it a canvas bag? Nutritional supplements? A matching 401k contribution? Pepper Morgan Pressley: Doc seems to be suggesting that, for a 59 year old, it's all about memories. You engage her by selling memories. Let's be honest, 59 year old women are not playing digital contests on an iPad while watching The Matrix, and if they are, then that type of experience won't cause a 59 year old women to spend more money at Gliebers Dresses. Roger Morgan: Woodside Research would disagree. They'd tell us we have to find younger customers, or we'll be out of business. And we won't find younger customers by selling memories, memories that mean nothing to a customer who idolizes Colbie Caillat. Glenn Glieber: Well, I've learned a lot today. This milk stool approach that Roger talks about is interesting. I really look forward to the Big Data discussion, that should be stimulating. What confuses me, however, is that if we do anything that Roger is talking about, we disenfranchise our 59 year old customer. And the harder we work at satisfying our 59 year old customer, the more we disenfranchise the customer who adores Brittney Spears. Dr. Gene Feldman: Colbie Caillat. Glenn Glieber: The more I listen, the more I realize that nobody has a solution, me included. How do we protect the past and still move into the future, without alienating our core customer audience? I guess we can just keep hoping for the economy to turn around. I mean, this is an election year, so we're sunk this fall, aren't we? Lois Gladstone: But our discussion was really engaging, wasn't it? I simply don't understand why email marketers are stuck analyzing opens/clicks/conversions. An entire industry follows best practices that miss much of the value of an email marketing program. Go spend a few minutes with your geeky statistician, and if you don't have one, hire me (click here) or ask your co-op or database provider to run an analysis for you. Run a logistic regression. Freeze your file as of one year ago. Create independent variables (recency, frequency, average order value), and include email subscriber status as a 1/0 variable (subscriber = 1, non-subscriber = 0). With your file frozen as of a year ago, run a ordinary least squares regression model ... similar variables as above, predicting how much a customer will spend if the customer purchases in the next year. By performing this analysis, you control for customer quality, allowing you to isolate the impact of email marketing on the overall business. This is not an analysis where you segment by presence of an email flag (you'll obtain terribly biased results if you do that, because email subscribers are either your best buyers or they never buy). I recently performed this analysis for an email marketer. Non-Email Subscribers (after controlling for other factors) had a 35% chance of buying again in the next year (across all channels). Email Subscribers (after controlling for other factors) had a 42% chance of buying again in the next year (across all channels). Non-Email Subscribers (after controlling for other factors) spent $200 in the next year, if they bought again (across all channels). Email Subscribers (after controlling for other factors) spent $230 in the next year, if they bought again (across all channels). What does this mean? Well, we can identify the value of an email address, on an annual basis. Non-Email Subscribers = 0.35 * 200 = $70.00 of future demand. Email Subscribers = 0.42 * 230 = $96.60 of future demand. An email subscriber is therefore worth $96.60 - $70.00 = $26.60 more per year, after controlling for all other factors. Now, this business typically measures email via opens/clicks/conversions. They have 100 email campaigns per year, and typically observe performance of $0.12 per email delivered. On an annual basis, this yields 100 * 0.12 = $12.00 of value. But this only accounts for opens/clicks/conversions. It does not count the fact that an email campaign inspired a customer to drive to a store and buy something, or caused the customer to buy via an email campaign, become more loyal, and then buy from a subsequent display ad or catalog. In other words, the email marketing program is more than twice as valuable as measured via opens/clicks/conversions. If you were an email marketer, wouldn't you want to know that? You probably already know this, but I get asked all sorts of interesting questions about catalog marketing. Let's answer one of the common questions. "We're thinking of starting a catalog. Can I get a quick list of best practices so that we can master this thing when we launch in six months?" Oh, I know, you're rolling your eyes. But let's think for a moment about how catalog marketing has four levels. Each level requires a different discipline, a different set of skills. Level 1 = Best Customer Mailings: When marketers think of catalogs, this is what they think about. You slap together a 64 pager with almost no thought about merchandising or creative. You just want to "make a statement about the brand". Well, you'll accomplish that!! These catalogs are generally sent to twelve-month buyers, they generally cost $0.60 each, and you generally earn $2.00 per book. When you run a p&l, you're not particularly inspired. When you analyze the results, you find that "best customers" were "engaged", as they spent $3.00 per book, while everybody else spent $1.00. This causes the marketer to think about "squeezing more juice out of the lemon", to proudly proclaim the magic of the 80/20 rule (80% of the sales are generated by 20% of the customers). This level of catalog marketing is what marketers think about. This level of catalog marketing requires little thought, little analysis, and very little of it is continued as a revolving door of Chief Marketing Officers enter/exit the building. Level 2 = Housefile Catalogs: This is a fundamental shift in mindset. Somebody with an interest in merchandise figured out that in a 64 page catalog there are a whole bunch of "correctable problems". Somebody realized that spreads with twelve items outperformed spreads with six items. Somebody realized that 70% of the products, while "brand appropriate", don't stimulate customer response, causing the business to lose a ton of money. Somebody realized that 80% of the orders in the catalog happen online or in stores, causing a shift in measurement of customer performance. The focus, of course, is still on mailing catalogs to housefile buyers, but this level of catalog marketing results in a significant improvement in productivity. Level 3 = Lapsed Customer Catalogs: The Level 2 marketer figures out how to ramp-up productivity, and that opens up the universe of names to customers who haven't purchased in two, three, four, or five years. Interestingly, these customers have different preferences. All of a sudden, you're busy analyzing order starters, figuring out how to get these customers to be inspired in the first twenty pages. You experiment with 48 pages, or 64 pages, or 80 pages, or 180 pages. You remail catalogs, you create new catalogs, you test offers on the cover, you spend hours agonizing over what goes on the back cover. When you're tempting a thirty-six month buyer to purchase, you have to have a discipline that few could match. In fact, your online marketing team will find your level of discipline completely stifling. If they find your level of discipline stifling, ask them why they spend so much time analyzing the conversion rates of 50,000 non-branded terms. Level 4 = New Customer Catalogs: The most sophisticated catalogers have prospect catalogs. Any cataloger that tells you that "prospect catalogs don't work" simply hasn't found the solution, and are consequently stuck at Level 3. The Level 4 catalog marketer figures out that new customer acquisition is the secret to growth ... in fact, the Level 4 catalog marketer is frequently mocked by just about everybody. You see, the hoi polloi love customer loyalty, but they never actually analyze customer behavior, never understanding that true growth happens when customer acquisition activities are profitably optimized. The Level 4 cataloger realizes that a 48 page catalog with only best product to new customers outperforms the 80 page monthly catalog on a demand per thousand pages circulated level, allowing the Level 4 cataloger to double new customer acquisition circulation, allowing the Level 4 cataloger to double profit in two years, allowing the Level 4 cataloger to pay huge bonuses to all employees. This level of catalog marketing requires merchandising and creative analytics that few companies can compete with. Level 4 catalog marketers pretty much do the opposite of everything that can be learned these days on Twitter. Level 4 catalog marketers seldom speak at conferences. Level 4 catalog marketers have seasoned and happy employees, boasting considerable industry experience. Level 4 catalog marketers could work at Fab.com, but are more interested in posting 10% EBIT in the teeth of a marketing environment that tells them their craft is dead. Your turn: What level is your organization at? You have to run this query. What percentage of customers who are placing their fifth, sixth, seventh, ... , one-hundredth order are purchasing via Search? Now, if you're a cataloger, and this percentage is a high percentage (say 15%), you have a whole bunch of explaining to do. Why would a customer who has purchased from your brand five times use Search as part of the purchase process? One camp will say that Search, among better customers, becomes a navigational tool. "They can't remember our brand name, or they forget how to spell it", that's what we tell ourselves. Except, that doesn't pass the smell test, does it? Because if that customer is such a loyal buyer, then that customer has a catalog sitting right next to her, and on that catalog, we print our brand name, we offer URL information. If you are a catalog marketer or an email marketer (hint, that's everybody), then the branded search hypothesis among loyal buyers fails the smell test. Your loyal customers are using search to comparison shop, or to obtain supplemental information, or to find a promo code, aren't they? That's not good, and that's not bad. It is simply the reality of a customer in 2012. She has a myriad of tools that she uses to conduct research. This is how Jennifer behaves. Way back in the day, I worked at Avenue A. This was in 2000, the wild west days of the internet. I was granted stock options that were worth $2,000,000. Three months later, my stock options that were worth $0. Fun times. We cookied client websites. We knew that in e-commerce, the average customer visited the website three times before buying something. We knew that this rule held for a customer on a first online purchase, and on a fifth online purchase. Not much has changed in twelve years. At first, an unconverted visit was viewed as a catastrophe. You had to execute "retargeting", or the more aptly named but equally invasive "remarketing" programs to "win back" customers. Trade journals, bloggers, ad folks, and analysts love these things. Customers? Not so much. We realized that the programs worked, but didn't move the needle. It's like improving an email marketing program where 1 in 700 buy something to 1 in 640 buying something. It's a nice improvement, but it is meaningless in terms of overall impact on customer behavior. Eventually, marketers embraced these unconverted visits as a sign that the customer was "engaged" with our brand. We convinced folks that it was good to spend money on outcomes that yielded no sales whatsoever. It's kind of like buying somebody a drink at a bar, then the person leaves and we say, "well, we engaged the person for fifteen minutes, so that counts for something!" Half of the marketing world wants you to spend more money to get that customer to convert. Half of the marketing world wants you to spend more money to engage the customer without a purchase. All of the marketing world wants you to spend more money. At Nordstrom, we had a "3/2/1" rule ... for customers who bought online and in stores, we observed that the customer visited the website three times a month, visited the store two times a month, and purchased once a month, 85% of the purchases happening in-store. Maybe we just realize that customers "do things". Maybe we don't have to spend money on retargeting. Maybe we don't have to spend money to encourage engagement. Maybe we just accept that the customer is going to do what the customer does, and we simply focus on providing a great experience coupled with great merchandise. A carefully crafted loyalty program can increase sales by somewhere around 10%, among customers who are deemed loyal. And yet, for most of us, loyalty programs don't work. At Nordstrom, good customers had an 85% chance of buying again in the next year, purchasing maybe ten times if the customer repurchases. That's 0.85*10 = 8.5 expected annual orders per loyal customer. If a loyalty program increases volume by 10%, then you achieve an incremental 8.5 * 0.10 = 0.85 orders per customer. At your garden-variety catalog brand, good customers have a 45% chance of buying again in the next year, purchasing maybe two times if the customer repurchases. That's 0.45*2 = 0.9 expected annual orders per loyal customer. If a loyalty program increases volume by 10%, then you achieve an incremental 0.9 * 0.10 = 0.09 orders per customer. Can you see the difference between the two business models? It doesn't matter what the cataloger does ... a loyalty program is going to make no difference whatsoever. It make all the difference in the world what Nordstrom does ... a loyalty program greatly increases sales and generates profit. Trade journalists, bloggers, and many loyalty experts miss this subtlety in customer behavior. Loyalty programs work in a high-frequency environment. Loyalty programs cannot force infrequent buyers into frequent buying behavior. You probably already know this, but give it a try anyway. Take 80,000 email addresses, and split them into two groups. The first 40,000 receive a month of typical email marketing messages. The second 40,000 customers do not receive an email marketing message, for a full month. After a month, segment your test results by store distance. 0 to 5 miles from a store. 6 to 10 miles from a store. 11 to 25 miles from a store. 26+ miles from a store. You'll find that you miss half of the sales that email causes, because customers who live within five miles of a store don't visit your website, instead opting to read your email marketing messages and then visit your nearby store. Give it a try, folks. Are you located in Kenosha? Racine? Suburban Milwaukee? Milwaukee? Fond du Lac? Sheboygan? Manitowoc? Oconomowoc? Oshkosh? Appleton? Green Bay? Reedsville? Combined Locks? Waupaca? Wautoma? Gills Rock? Green Lake? Antigo? Peshtigo? If you are, and you'd like to have me visit for an hour on the morning of July 20, respond to this offer for an hour of free consulting (click here to respond). I have a free hour from 9:30am - 10:30am. Is there a word that you hear more often these days than the word "scale". Loosely defined, "scale" is a concept where somebody is able to make a small investment, and grow incrementally without making additional investments of time, resources, or money. In the startup world, Facebook and Twitter "scale". You can achieve hundreds of millions of users without a lot of incremental work ... the first million users are hard ... the next hundred million users require almost no work as the first million users do the work for you, at minimal cost to you. In the catalog marketing world, co-ops reflect the concept of scale, on both sides of the equation. I recall being at Eddie Bauer, back in 1998, when a sales rep from a co-op told me that "there will be a day when we have every transaction from every catalog brand ... when that day comes, we'll know everything about everybody and everybody will be forced to use us." That's what scale is about. And the co-ops got there, obliterating the list industry in the process. This idea has been "co-opted" on the other side of the equation. If you attend any catalog-based conference, you'll hear an Executive say that they love working with co-ops because "sales scale with co-ops". In other words, it takes the same amount of human work to order 10 names from a co-op as it takes to order 10,000,000 names from a co-op. Once that realization happens, laziness sets in. As long as the co-op delivers acceptable results at a reasonable cost, there's no need to innovate, to work hard, to do anything. Just ask the CFO to cut a check each month for 3.2 million names, and watch $4.0 million in sales come in. It's at that very point that the cataloger is doomed. The well-documented feedback loop, where 55+ rural customers tend to buy from a cataloger, causing the co-ops to optimize response for 55+ rural customers, causing the cataloger to only acquire 55+ rural customers, causing the co-ops to further optimize for 55+ rural customers, causing the creative/merchandise in a catalog to evolve to favor 55+ rural customers, causing younger customers to run away, frightened. Knowledge Gap: Ask any catalog exec why new customer acquisition is trending above/below plan, and you'll get a simple response ... "Co-op names are/are-not working". That's like saying you're having a heart attack because your blood pressure is high. Why is your blood pressure high? Be honest, do you, as an Executive, know anything about the names you are getting from the co-ops? If not, then you're trapped in the knowledge gap. Laziness: Businesses are built on hard work. Once it becomes easy to do something, it becomes hard to find the hunger to do it better. Other Scalable Methods: What is scale to one business is hard work to another. Fab.com can grow from zero to millions in a short period of time via Facebook, Twitter, and Email. To them, the business "scales". To the cataloger, acquiring customers via Facebook, Twitter, and Email is one-to-one marketing, hard work, and is nearly impossible. The farther a customer base evolves away from a younger audience, the harder it is to use methods that appear to scale to other businesses to scale your business, driving you further and further way from those methods. For many catalogers, this is where we are, now. Scale is working both for us, and simultaneously against us. Many of you are new subscribers, so a little background: Gliebers Dresses was a fictional story of an Executive Team at a traditional catalog brand dealing with changing times. At first, the story served as a Multichannel Forensics case study. The audience, however, enjoyed the quips and commentary between Executive Team members. The story evolved to facilitate a discussion about the state of modern marketing. For a period of time in 2009-2010, Gliebers Dresses was the most popular series of blog posts I wrote. If a fictional story about the intersection of modern marketing and traditional catalog marketing is not your cup of tea, then move along, there's nothing to see here. If you're looking for a brief mid-July diversion from the tedium of day-to-day job responsibilities, give this a read. Setting: The Gliebers Dresses board room. Glenn Glieber, the founder and long-time President of Gliebers Dresses, purchased the business from his son, an individual who did not have a passion for catalog marketing, to say the least. Mr. Glieber is setting two years of retirement aside, focusing instead on restoring the brand to former glory. Mr. Glieber is being re-introduced to the business in this Executive Team meeting. Glenn Glieber (President and CEO, Gliebers Dresses): Alright everybody, please, take your seats. Let's begin the meeting. As you now know, I have purchased the assets of Gliebers Dresses. I am re-assuming the role of President and Chief Executive Officer, effective immediately. Roger Morgan, who acted as President and CEO for the past year-plus, will return to his former position as Chief Operating Officer. I would like to thank Roger for his service during the past year. Meredith Thompson will re-assume her role as Chief Merchandising Officer. Lauren Fetzer purchased the assets of our "Charisma" brand, and will manage that business as a standalone unit, with no association to Gliebers Dresses. Libby Benson, the Director of Social Media for Charisma, will join Lauren and is no longer on the Gliebers Dresses payroll. We are back to being a pure catalog brand. Let's not look back at what happened in the past year, let's move forward. Pepper Morgan Pressley (Chief Marketing Officer): It is so good, SO GOOD, to have you back Mr. Glieber! I cannot tell you how good it is to bask in true leadership once again. Glenn Glieber: Thanks Pepper, I appreciate your feedback. Would you be willing to give us a sales update? Pepper Morgan Pressley: Sales in June were down six percent to last year, and 2011 June sales were down five percent to 2010 June sales. Overall, we're down about 10% to where we were two years ago. Roger Morgan (Chief Operating Officer, Former CEO): But we have a plan to combat this trend, Mr. Glieber. We were just about to roll out our Omnichannel Initiative. Glenn Glieber: Omnichannel? What does Omnichannel mean? Dr. Gene Feldman (Vice President of Global Brand Direction): If I may, I think it is important to point out that our Colbie Caillat sundress initiative is going to launch sales into the stratosphere. We're currently negotiating with her marketing team, as we speak. I don't think you can underestimate the brand power a major recording artist brings to the table. Glenn Glieber: Who, are you? Lois Gladstone (Chief Financial Officer): That's Gene, Roger hired him to be the Vice President of Global Brand Direction. Dr. Gene Feldman: Please call me Dr. Gene. Glenn Glieber: Thanks, Doc. What's you background? What are your catalog-specific qualifications? Meredith Thompson (Chief Merchandising Officer): Mr. Feldman was the brains behind the proposed "Fifth Meal" initiative at Taco Bell. Pepper Morgan Pressley: We've all seen the commercials. The wedding party riding in a limo, enjoying tacos at eleven at night, that's fourth meal. Doc was instrumental in creating the global brand framework necessary to launch a fifth meal initiative at Taco Bell. Glenn Glieber: You invented fifth meal, Gene? What does that have to do with cataloging? Pepper Morgan Pressley: Roger hired him, Glenn. Glenn Glieber: Lois, why are you on crutches? Pepper Morgan Pressley: Oh, poor Lois. Roger took us to California for two full days of team building with Tony Robbins. Some team building exercise that was. Lois was terrified by the thought of walking across hot coals, stopped half-way across them, freaked out, and burned her feet. Roger Morgan: Lois was afraid of walking into the future, Glenn. Lois Gladstone: I was terrified by the cost of seventeen employees spending two full days with Tony Robbins. Roger Morgan: Oprah made it across the coals. Dr. Gene Feldman: ... after dinner, things get interesting. Obviously, you have fourth meal, that's well documented. The challenge, then, is to keep consumers awake. Think Mountain Dew, which we served in generously sized portions at Taco Bell, that does the trick. Now if you can keep a consumer awake longer, you increase the chance of the consumer wanting to eat something. That's where fifth meal comes in. Roger Morgan: Tony told us that for changes to be of any true value, they've got to be lasting and consistent. Lois Gladstone: Second degree burns leave scars that will be lasting and consistent. Dr. Gene Feldman: So, in many ways, this whole Colbie Caillat negotiation is a lot like fifth meal. We're trying to find additional ways to engage today's time-strapped consumer. It's an exciting time to be at Gliebers Dresses. Glenn Glieber: Can somebody explain what this whole Omnichannel Initiative is? Meredith Thompson: Roger believes that Omnichannel is the linchpin to future success. Roger Morgan: Meredith, I don't believe in anything. In my hand, I hold a report from Woodside Research. In this $495 beauty, Woodside Research clearly articulates that the future will be owned by nimble brands that are able to engage cost-conscious and time-strapped customers across channels. Brands that are not omnichannel tempt obsolescence at their own risk. We have to greatly expand into all available channels, now. Lois Gladstone: We spent a lot of money on research reports and Tony Robbins seminars in the past two years, Mr. Glieber. Pepper Morgan Pressley: Roger, haven't you always been an advocate of multichannel strategies? How is omnichannel different than multichannel? And how did the whole multichannel think work out for us? Dr. Gene Feldman: On our YouTube channel, I envision Colbie Caillat singing an acoustic version of "Brighter Than The Sun". Except, everybody in this video is wearing Gliebers Dresses. Think of all of the new customers we'd acquire, the brand exposure? We're basically making a play on what Dre did with Beats. They own 53% of the headphone market, and they didn't exist six years ago. Think about that for a moment. You plant your product on famous people, and the hoi polloi follow. You can literally create a market. MeredithThompson: Or you rent 3.2 million names from a co-op and call it a day. Roger Morgan: The concept is called Omnichannel because you have to do everything, and you have to integrate everything together. You think about the young shopper, checking into Forever 21 via Foresquare, then looking at her favorite merchandise. She showrooms, if you will ... she uses search on her iPhone to compare prices, and there she finds Gliebers Dresses, who is willing to send her a comparable dress next-day-air with free shipping and twenty percent off. Lois Gladstone: The profit and loss statement is burning hotter than my feet. Roger Morgan: But this is the key to the whole thing, folks. We have to do everything. Free shipping. Expedited shipping. Twenty percent off. Search marketing. Email marketing. Catalog marketing. Mobile marketing. Local marketing. Telemarketing. Loyalty Marketing. iPad marketing. Field marketing. And if we do all of this, we create buzz, and all that buzz yields a glow. Ultimately, it's like free marketing. Glenn Glieber: I love free marketing! Lois Gladstone: So we have to spend a lot of money on multichannel marketing so that we fuel free marketing? The fusion of multichannel marketing and free marketing yields omnichannel marketing? Roger Morgan: Woodside Research says that if you do all of this, you end up fueling word of mouth marketing, and that's where this whole thing is headed. Dr. Gene Feldman: This is how it starts. Lightning strikes the heart. It goes off like a gun. Brighter than the sun. Glenn Glieber: What the heck are you talking about Feldman? Dr. Gene Feldman: The Colbie Caillat video. Her and her posse, wearing Gliebers Dresses. Kids want to be like Colbie Caillat. She's breezy. She's everything the Gliebers Dresses brand stands for. She's a less edgy Taylor Swift. This is how it starts. And the kids, they know YouTube. They're not watching Blue Bloods there, either. Create a new reason for the young ladies to buy something. Tell them what to do. Curate for them. It's a lot like creating a reason for fifth meal. Lois Gladstone: I like Tom Selleck on Blue Bloods. He's not breezy, he's rugged. Meredith Thompson: We do that in the catalog, you know. Just last month, we had a spread that featured the ladies of the Amherst Farmers Market. The phone was ringing off the hook. Pepper Morgan Pressley: Roger, when is the last time you entered a mall and showroomed a dress? Are you buying dresses now, too? Roger Morgan: I was in the mall last week with Sonora ... that's my daughter, Doc. You watch how a teenager shops and you learn a lot. Pepper Morgan Pressley: I guess you can learn a lot by watching a teenage girl eight days a month. Dr. Gene Feldman: 8.6 million people have watched "Brighter Than The Sun" on YouTube. That's how you reach an audience at low cost. Meredith Thompson: How do I forecast unit sales for a video that will be watched somewhere between 3 times and 8.6 million times? I know what happens when I rent 3.2 million names from the co-ops. Lois Gladstone: Yup, $4 million in sales and $35,000 in profit. Every time. Pepper Morgan Pressley: And if we keep doing that, our customer will be Bea Arthur in Golden Girls. Roger Morgan: Do you all remember what Tony Robbins told us? He said "If you want to be successful, find someone who has achieved the results you want and copy what they do and you'll achieve the same results." Pepper Morgan Pressley: So we should copy what Woodside Research does, because they've achieved a resounding success with an omnichannel platform? When is the last time you purchased a report from Woodside Research via their Twitter feed? When is the last time Woodside Research sent you a personalized and highly relevant email campaign that was actually customized to your own interests? When is the last time you looked at a Woodside Research report on your iPhone? When is the last time you checked in at Woodside Research office headquarters via Foresquare? When is the last time Woodside Research invited you to a big research event for free because you were a devoted member of their loyalty program? Roger Morgan: Pepper, why don't you craft a strategy, you're the Chief Marketing Officer, right? Act like one. Nobody in this room is outlining a path to the future except me. And Woodside Research. Meredith Thompson: And Doc and his music video. Dr. Gene Feldman: Has anybody watched that new Dallas show on TNT? Somehow they are able to seamlessly integrate old and new ... in one platform. One brand. Lois Gladstone: This is a catalog, Gene! Dr. Gene Feldman (leaning over to Glenn Glieber): If you can't win the hearts and minds of your employees, how can you win the hearts and minds of your customers? Glenn Glieber: It's been a spirited discussion, folks. I see that nothing has changed in a couple of years. It's great that the heritage of the corporate brand still exists. Based on what I've heard, we either have to do everything, or we have to double-down on what we've always done so we can forecast the business more accurately, or we have to move into music videos. At least we have choices. Let's meet tomorrow for breakfast and dig in! Meredith Thompson: If we stay up all night, can we come in to work and call breakfast fifth meal? Why Do We Look At The Wrong Metrics? Our laser-like focus on campaigns diverts us from measuring what really matters, doesn't it? These days, everything we look at is campaign based ... and for good reason, because all we ever do anymore is manage campaigns. Hundreds and hundreds of omnichannel campaigns! We measure how each campaign performed. We "optimize" each campaign, attempting to achieve the campaign nirvana! Campaign optimization is a lot like trying to win at the stock market every single day. You have an endless array of real-time information, you hone your trading skills, and yet, you lose money 49.8% of the days you participate. Campaign optimization is no different. Take a look at the table above. For each of the past twelve years, this business measured customer loyalty metrics, and counted how many new customers the business acquired. 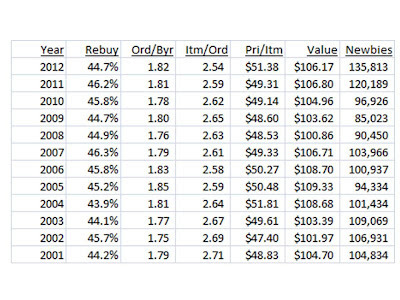 Look at annual repurchase rates among the twelve-month buyer file ... they barely change, do they? This is typical. We don't make customers "more loyal", even though we all have loyalty programs. Don't believe me? Run your own table. Take a look at what your data suggests, for the past year. Orders per buyer are fairly constant. Items per order vary, in the opposite direction of price per item purchased. This is also common ... when items become more expensive, the customer purchases fewer of them. When items become less expensive, the customer purchases more of them. If you don't believe this, run your own table, find out for yourself! 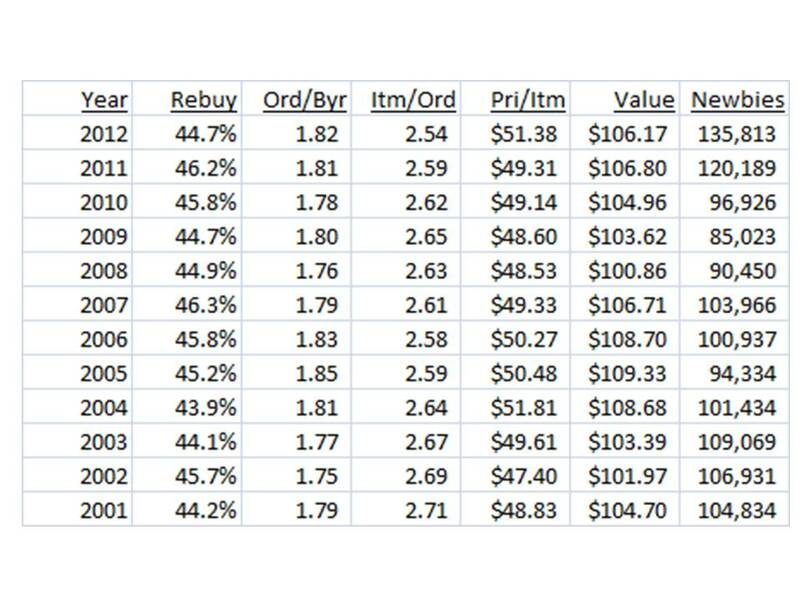 Value, defined as repurchase rate * orders per buyer per year * items per order * price per item is reasonably constant. In twelve years, this metric bounces around by about 8%, but doesn't fundamentally move, does it? Think of all of the campaigns executed over a decade, all designed to "optimize" customer performance ... all of the analytical and marketing anguish poured out over making sure that the "call to action" is exactly right. Think of the shift in customer behavior between 2001 and 2012. And yet, the customer behaves exactly the same. Without a steady diet of new customers, this business is stuck, and will always be stuck. Sort of like your business. Unless your repurchase rates are 60% or greater, it is terribly hard to move customer loyalty metrics. The business survives and thrives because new customers are acquired at rates greater than in prior years. Or, the business survives and thrives because merchandise productivity is improved. This can easily be measured through a comp segment analysis. When we constantly look at response rates, open rates, click-through rates, conversion rates, landing page traffic, shopping cart abandonment, and a veritable plethora of campaign-based metrics, we miss the real story ... that everything we're measuring fails to describe actual, annual, customer behavior. You remember the Seinfeld episode where George was coaxed by Jerry into "doing the opposite". If every instinct he had was wrong, then the opposite would have to be right! It might be time for us to try a few things that are opposite this summer, just to see how they work. Instead of sending a hotline catalog to any customer who purchases, try sending them only to customers who use mail/phone. Among customers who have purchased 3+ times, and last purchased via email, try not sending those customers catalogs for the next three months, just to see what happens. Instead of keeping the contact strategy the same as it has been since the 1984 Olympiad, why not add a small catalog to the contact strategy for mail/phone buyers who purchased in the past year? Instead of tethering all activities to the catalog, why not put your smartest 29 year old marketing staffer on a new mission ... to create a new brand that appeals to Jasmine's generation? Instead of sending catalogs to retail customers who just purchased, why not instead have your store manager call customers, thanking them for their recent purchase, asking if there is anything else s/he can do to help with the recent order? Your thoughts ... what are some of your ideas for "doing the opposite"? ?